The strong correlation between Galactic Cosmic Rays (GCRs) and cloud formation has for decades been postulated as a primary mechanism for solar-driven natural climate change. Concisely, “When the Sun is active fewer cosmic rays reach the Earth and, with fewer low clouds, the world warms up” (Svensmark et al., 2017). Since about 2000, however, this GCR-cloud correlation has been violated (solar activity has declined without accompanying GCR flux), leading many to question the link. 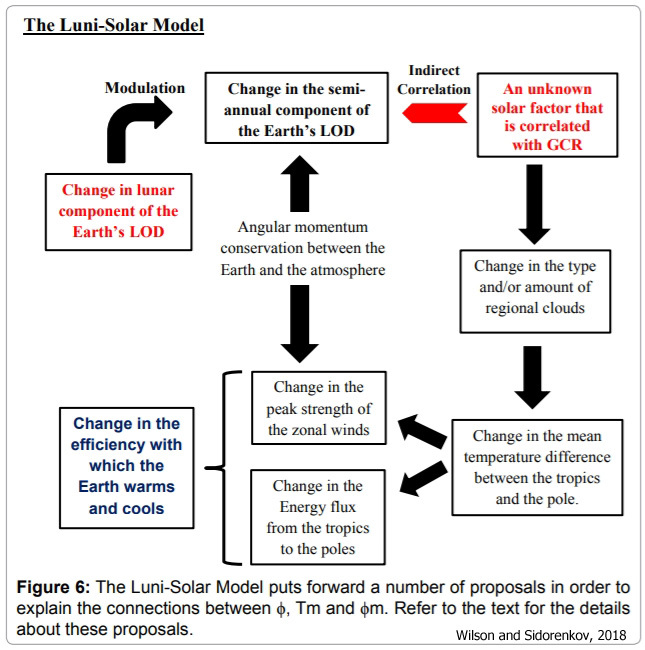 A new paper suggests this post-2000 “violation” is actually “not…unexpected”, has occurred previously, and does not undermine the Sun-GCR/cloud explanation for naturally-driven climate change. 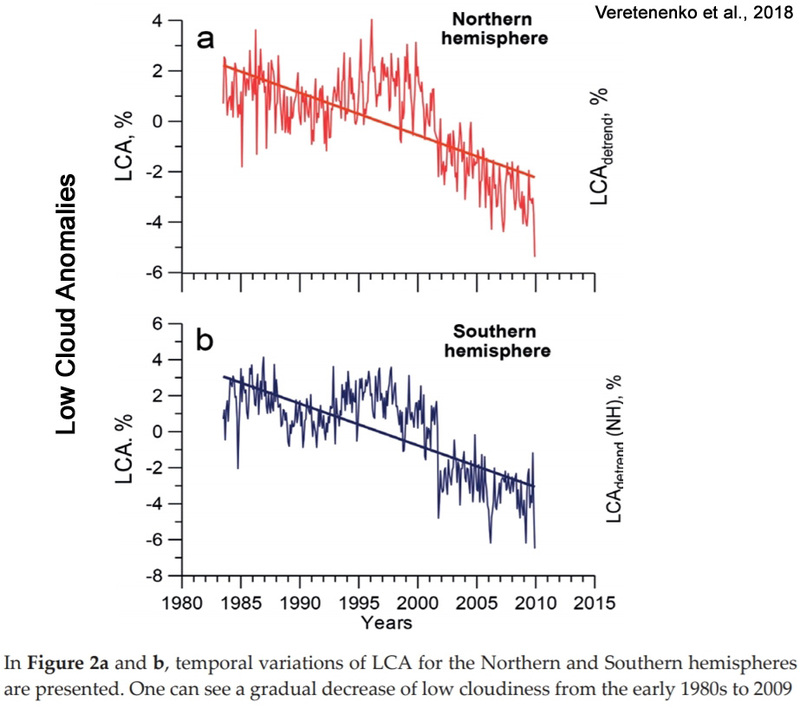 Cloud cover changes dominate in altering the amount of solar radiation absorbed by the Earth’s surface (Stanhill et al., 2014; Mateos et al., 2014). With fewer clouds, more solar radiation can be absorbed by the oceans rather than reflected back to space; this, in turn, leads to warming. Cloud cover changes and the concomitant alteration of surface solar heat absorption can therefore explain the 1980s to 2000s warming via the increase in absorbed solar radiation (Pinker et al., 2005; Pallé et al., 2004; Herman et al., 2013; Wang et al., 2012; Calbó et al., 2016; Kauppinen et al, 2014; McLean, 2014). There has recently been a scientific “breakthrough” in understanding the “missing link” between the Sun’s modulation of cosmic rays and thus cloud cover, supported by real-world observational evidence (3,100 hours of data sampling and controlled experimentation). 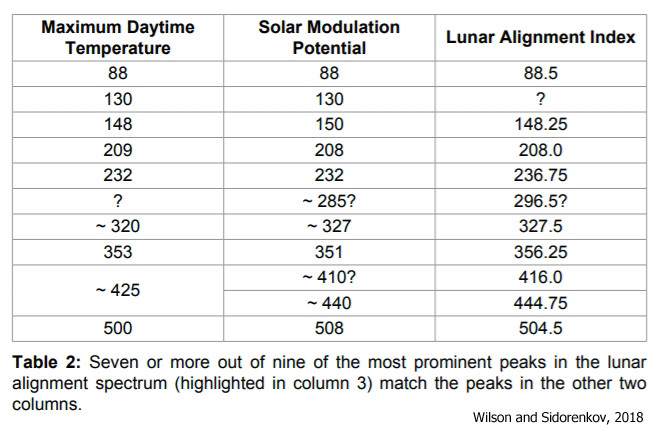 The following is an abbreviated list of 14 scientific papers supporting the Sunspot Activity→Cosmic Ray Flux→Cloud Cover Changes→Climate Changes conceptualization published within the last year. “‘Finally we have the last piece of the puzzle explaining how particles from space affect climate on Earth. It gives an understanding of how changes caused by Solar activity or by super nova activity can change climate.’ says Henrik Svensmark, from DTU Space at the Technical University of Denmark, lead author of the study. •Variations in the Sun’s magnetic activity alter the influx of cosmic rays to the Earth. •When the Sun is lazy, magnetically speaking, there are more cosmic rays and more low clouds, and the world is cooler. •When the Sun is active fewer cosmic rays reach the Earth and, with fewer low clouds, the world warms up. 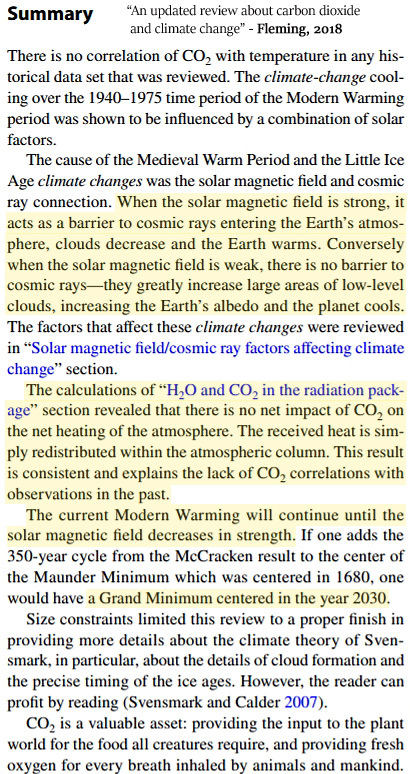 • The coolings and warmings of around 2°C that have occurred repeatedly over the past 10,000 years, as the Sun’s activity and the cosmic ray influx have varied. • The much larger variations of up to 10°C occuring as the Sun and Earth travel through the Galaxy visiting regions with varying numbers of exploding stars. note an extremely interesting GCR process in star formation clouds. Again it looks like weather and star formation activity is a galactic phenomenon, or rather qualitatively different grades thereof. A great link, indeed. The GCR influence on terrestrial climate over millions of years was articulated by Svensmark and Calder in their marvelous book “The Chilling Stars.” This hypothesis, for which there is increasing empirical evidence, constitutes a major event in environmental thinking, insofar as it reveals how long-term processes of the Milky Way galaxy and beyond affect climate and thereby terrestrial evolution. The Solar System is our immediate neighborhood, but Earth’s development continues to be affected by events in the far vaster domain. 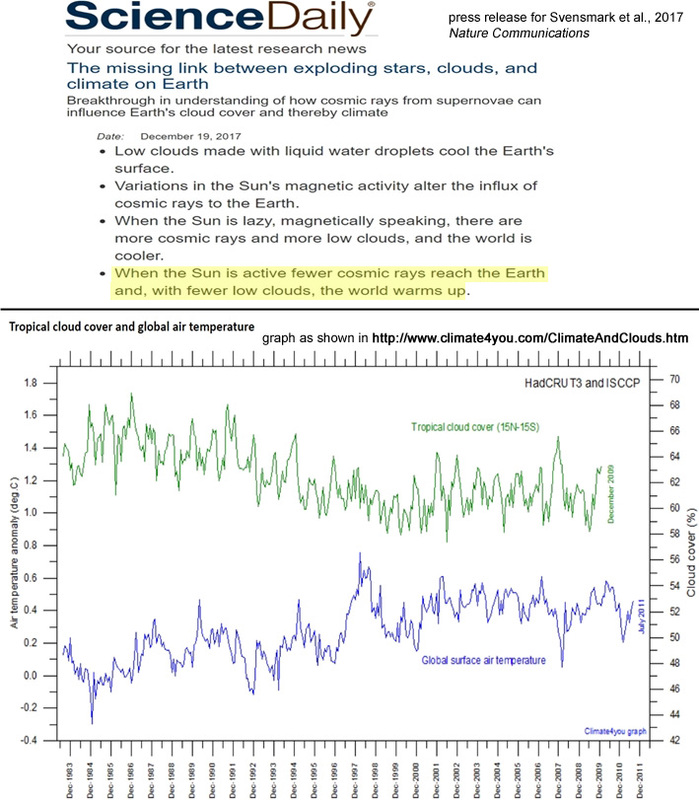 And the cloud error in climate models is 140 times greater than the CO2 non-warming signal AGW scammers are attempting to fabricate. Thanks, spike. That’s a keeper. Don’t hold your breath, dennis! Incidentally, Pierre is citing no fewer than 13 papers here. I wonder how long before seb turns up to tell us they’re all b******s and puts us all right! I can barely wait. It’s funny that searching for a GCR cloud connection only brings up pseudoskeptic blogs as if that were an exclusive topic to their part of the internet. 13 papers, seb. How come you know better than them since your knowledge even of basic physics — as demonstrated on these pages day in day out — is non-existent? A little humility, seb. Just for a minute believe that there are scientists who know more than you do and happen not to agree with you. I know it hurts when people think differently from you but learn to live with it. One day you will be glad you did because that way comes peace and understanding. All that your way leads to is frustration, heart attacks, and mockery. And since you patently talk nonsense every time you post, the mockery will be well-deserved! Looks like Señor Cañete saw some light! The bad news is, there are any “climate targets” still in place!